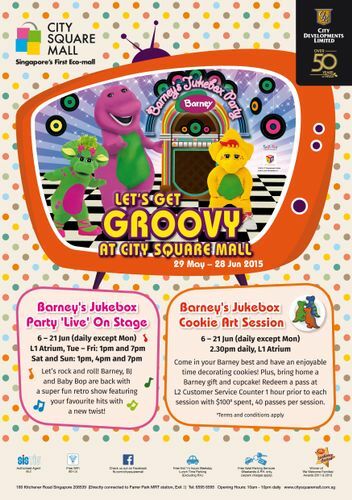 This June school holidays, City Square Mall proudly presents the highly anticipated live show - Barney’s Jukebox Party! With a minimum spending of $60, shoppers can redeem an exclusive pass for the Meet & Greet session and a carnival ticket one hour prior to each show. Limited to 50 sets per show. Children aged four years old and above are invited to come in their Barney clothing and decorate their own delectable cookies in this exciting activity where creativity meets delicacy! With a minimum spending of $100, shoppers can redeem a limited pass for the Barney’s Jukebox Cookie Art Session one hour prior to each session. Limited to 40 passes per session.